I relocated to New Bern in 2000 from Rockland County New York, a suburb of New York City, with my husband Tom who serves as Chairman of the Craven County Board of Commissioners. I have a B.A. degree from CCNY (City College of New York) with a major in psychology. Shortly after graduating I began working as a Counselor in a federally funded work/training program. Several years later I went into private industry accepting a position as an Insurance Sales Representative for Metlife Insurance Company. In my fifteen year career with Metlife I held positions in Sales, Underwriting, Compliance and Marketing. 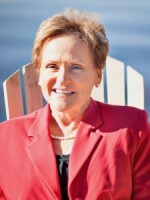 Upon relocating to New Bern, I worked as a Preschool Teacher and later worked as a Receptionist and Coach for Weight Watchers, Inc. With a long held interest in Real Estate, I made a decision to obtain a Real Estate License and am pleased to be affiliated with Neuse Realty, Inc. working full time in this capacity. In my free time I serve as a volunteer on the East Carolina Council on Aging, Adult Care Committee and I also serve as a volunteer on the Board of the Department of Social Services (DSS). My hobbies include daily exercise (walk/jog, pilates), singing with the Fairfield Harbour Chorus, studying to enhance my knowledge, and I also enjoy an occasional round of golf.